Spark and Cassandra provide a good alternative to traditional big data architectures based on Hadoop hdfs, map-reduce and hive. In this post/tutorial I will show how to combine Cassandra and Spark to get the best of those two technologies and provide faster analytics on an operational low-latency data store. As a demo, we will cluster check-in transactions in New York using the gowalla dataset. 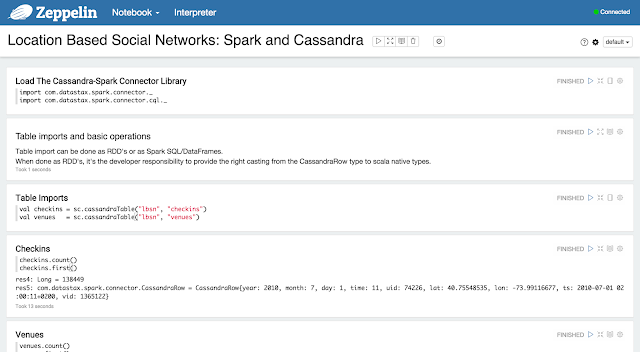 Clustering will be performed on Spark using the mllib library while extracting data from a cassandra keyspace using the Spark-Cassandra connector. Apache Cassandra is an open source distributed database management system designed to handle large amounts of data across many commodity servers, providing high availability with no single point of failure. Cassandra offers robust support for clusters spanning multiple datacenters, with asynchronous masterless replication allowing low latency operations for all clients. Cassandra's data model is a partitioned row store with tunable consistency. Rows are organized into tables; the first component of a table's primary key is the partition key; within a partition, rows are clustered by the remaining columns of the key. Other columns may be indexed separately from the primary key. Tables may be created, dropped, and altered at runtime without blocking updates and queries. Cassandra does not currently support joins or subqueries. Rather, Cassandra emphasizes denormalization through features like collections. However as shown in this post, this limitations can be overcome by using Spark and Cassandra together. This library lets you expose Cassandra tables as Spark RDDs, write Spark RDDs to Cassandra tables, and execute arbitrary CQL queries in your Spark applications. Zeppelin is really early days, but very promising and a nice alternative to ipython. Currently, it can only be build from sources. Check the master branch on github. You need to have Cassandra, Spark and Zeppeling running on your system in order to proceed. For those of you who want to give it a try, I have written a very rudimental script which downloads, builds and install all the necessary tools on a local directory (no admin required). First clone the project from github, then run the install.sh script. Since the script will build Spark and Zeppelin from source, it's gonna take a while. I am planning to test the pre-built Spark when I have some more time. Again, I have prepared a script start-all.sh, which runs all the various ingredients. A similar script stop-all.sh is available to stop all services. Spark is configured to run in cluster mode (albeit on a single node), a password might be prompted, since the master and the workers of spark communicate via ssh. Cassandra can be accessed with the cqlsh command line interface. After installing and setting up the system, type ./apache-cassandra-2.1.7/bin/cqlsh from the root of the git project, to start the cql client. The project is being developed in the context of the SInteliGIS project financed by the Portuguese Foundation for Science and Technology (FCT) through project grant PTDC/EIA-EIA/109840/2009. The csv files provided in this demo have been extracted using a python notebook. Some info about those files. The checking file checkins.csv has year, month, day and utc checkin date and provides the coordinates of the checking, the id of the venue and the id of the user. The venues.csv provides the id, the coordinates and the name of some of those historical venues. 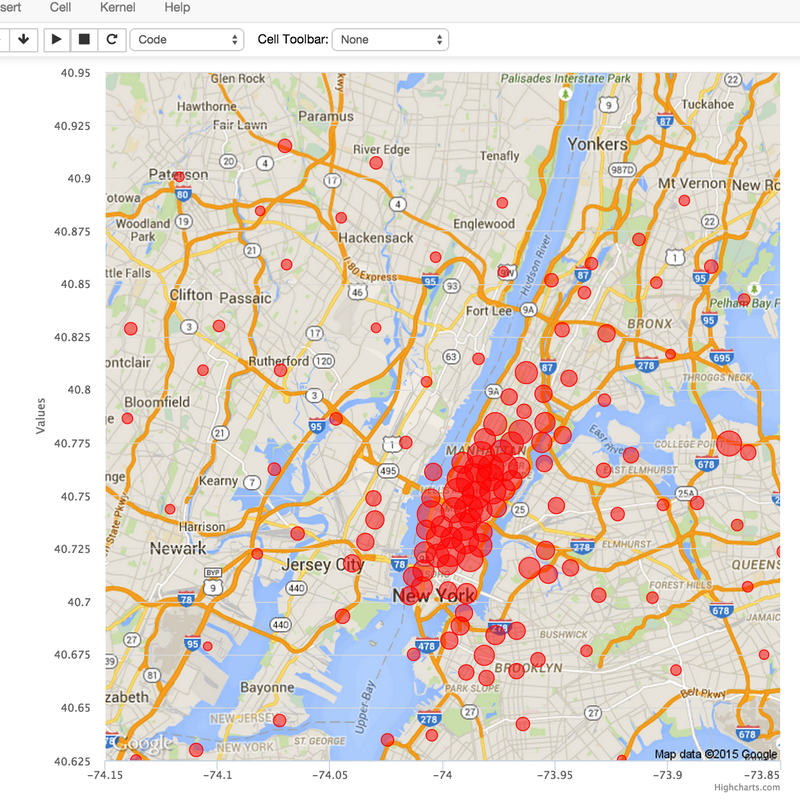 Here below a few pics showing how gowalla app ramped up during 2010, and an overlay of the hottest checked in spots in New York during 2010, generated using google maps and highchart, clustered using scikit k-means. Please refer to the ipython notebook (available on the github repo https://github.com/natalinobusa/gowalla-spark-demo) for more details about how this graphs, and the csv files were generated. First, create the keyspace and the tables. Since in this demo we are focusing on queries and data science, we are not going to set up proper replication as it should be for an actual cassandra cluster keyspace. For the checkins table, I am gonna model the primary key, using a partition key with year and month, and a cluster key of days and timestamp. For this specific example we use a time field expressing the time of the day in seconds, since the date is already available in the other partition and clustering keys. This specific modeling of time will turn up useful later on since I can query a range of days in a month or a given time window during the day, by making using of the properties of the clustering key. Finally we add the uid as a clustering key to avoid overwrites in case that two users check in at exactly the same date and time. The venue table is much easier to model and I will just provide a key based on the partition by venue id. InvalidRequest: code=2200 [Invalid query] message="PRIMARY KEY column "time" cannot be restricted (preceding column "day" is restricted by a non-EQ relation)"
First, open the zeppelin console on the url http://localhost:8888/, then open up the notebook Location Based Social Networks: Spark and Cassandra. You can go through the demo yourself, I will present here below an extract of what you can do with spark, cassandra, and the cassandra driver for spark. Table import can be done as RDD's or as Spark SQL/DataFrames. When done as RDD's, it's the developer responsibility to provide the right casting from the CassandraRow type to scala native types. The where clause translates back into cql, therefore it would allow selection on partition key and range on clustering key. How many checked in Soho? filter(coord => coord._1 > 40.7187 & coord._1 < 40.7296). filter(coord => coord._2 > -74.0055 & coord._2 < -73.9959). By using the CassandraSQLContext, the schema is extracted from a sample of the read data. Therefore no explicit casting/mapping is required, and you can move faster to standard scala native types. When the query is compatible with cql filtering and selection is executed fully on the cassandra side. By using the CassandraSQL context you can also define a query which would require also some filtering on the spark side. val df = locs_cid.select("cluster", "name").